Logins this hour: 5509 ? The Template tool fills weeks or months of the schedule with people's standard assignments. It can also use a schedule that you create as a pattern for making future assignments; people you place in subsequent schedules get a set or sequence of shifts as defined by the template but the people need not be the same as those in the original model schedule. Once you've populated a schedule with a template, you can make whatever changes you need to accommodate vacations and other special considerations. Or you can use the autoscheduler to fill empty shifts around those populated by the template. A template can include any number of schedule rows but the Template tool will only store assignments for shifts that are visible. To create a template for some shifts but not others, use the Schedule Content/Subset feature to hide all but the shifts you want to be part of the template. You have the option to create and name multiple templates, or to generate single-use patterns which replace the last template stored. Go to a blank part of the year and enter assignments. Fill in 1 week, 2 weeks or however many days/weeks it takes to complete one cycle of shifts. Go to the Window menu and select Template. In the upper-right of the Template box, select the range of dates to store as your template. To create a single-use template and overwrite the last pattern stored, simply click the button in the lower-left that says Store N-day template, where N is the number of days in the date range you selected. To create and name multiple templates, hold the 'Alt' key (if working on a PC), or the 'Command' key (on a Mac) as you're clicking the button in the lower left labeled Store N-day template. Most templates involve replicating assignments on the same day of the week as the example days stored in the template. To keep assignments lined up on the correct days of the week, the number of days stored in the template must be a multiple of 7. A template of weekday clinics that repeats every week needs to run from Sunday through Saturday or Monday through Sunday and be a full 7 days long, even if no one is scheduled on the weekend. When you store a template, OnCall records a copy of all assignments in the selected date range. It can compare actual schedules against the stored template and flag assignments that differ from the template. Check the flag switches option in the Template box to use this feature. To apply a static "Copy & Paste" template, place your cursor on the first date of the row you want to template. Extend the end date for the range you want to fill using the date selectors in the upper-right of the Template box. If you've chosen to create multiple templates, make sure the correct template name is listed in the drop-down menu located in the middle left of the template box. Then click the 'Apply N-Day Template' button in the lower left (where N represents the number of days you're asking the software to template). Select "1st Mon. of month = 1st Mon in template, etc." for assignments to automatically line up by the appropriate day-of-week. The Template tool will determine whether each day is the 1st, 2nd, 3rd and so on of its kind in the month, find the matching day in the template, and get the appropriate assignments. To use the template as a pattern, first store your template as above and then check the Apply as anonymous pattern option. This turns your template into a pattern not linked to specific people. When you put someone into a shift, OnCall looks up who was on that shift in the template and it gives the person you selected the same set of shifts that the person in the template had. Pattern fill call in the Options menu must be checked for OnCall to autofill assignments using an anonymous pattern. Turn Pattern fill off to make or change assignments that do not follow the standard pattern. If your schedule repeats assignments based on days-of-the-month such as "1st and 3rd Monday of the month" OnCall can apply a template based on one month of your schedule to your other months by adjusting the template to match days of the week. Store one month of your schedule as a template as described above. When filling the template, check the box labeled 1st Mon. of month = 1st Mon in template, etc. 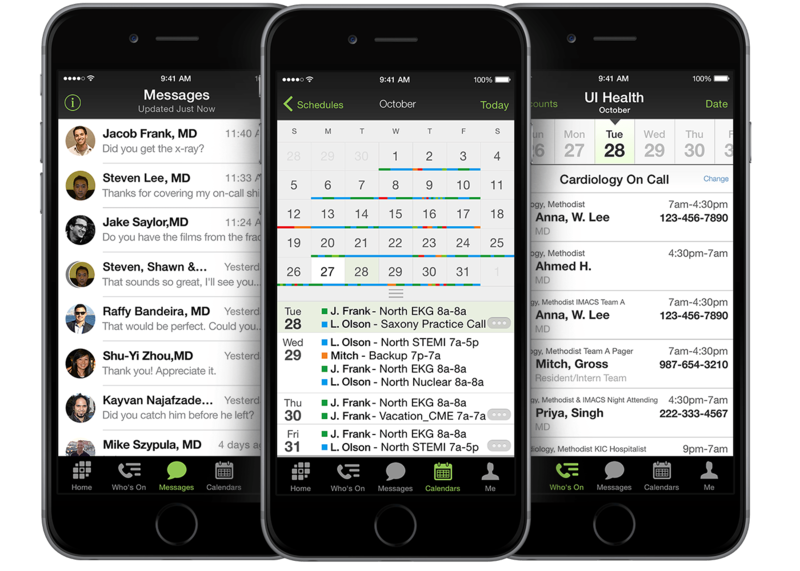 OnCall will adjust the template as it applies it to ensure that your days of the week stay consistent. Keep in mind that this may leave gaps. For example, if you store a month that has three Wednesdays as your template and fill it in to a month that has four Wednesdays, it will leave the last one empty. Leaving 1st Mon. of month = 1st Mon in template, etc. unchecked will fill your template day-by-day, so that the first day of your template is the 1st of the month, the second is the second and so on, without regard for days of the week. Example 1 - "Copy & Paste". Fill in a week of a single shift so that one person is on Monday through Thursday and a different person is on Friday through Sunday. Set the dates in the upper right of the Template box to cover that one week, starting on Monday and going through Sunday, and click "Store 7-day template". If you advance the end date out by a few weeks or months and click Apply, the same two people will go in for all the weeks. That's the standard way of applying a template for assignments that remain static from one week to the next. Example 2 - Apply as pattern. Fill in a week as above. After clicking to store as a 7-day template, turn on the option to "Apply as anonymous pattern". The Apply button in the template box turns gray because you apply an anonymous template by making assignments on the schedule itself. Put someone in on a Tuesday and OnCall puts the same person in on Monday through Thursday, even if you choose a person who was not in the original template. It's using the template as a pattern to follow, not as fixed assignments for specific people. Example 3 - Overlapping patterns. Some patterns take many weeks before they repeat for the same person/schedule-slot but by restarting the pattern before the entire set of template days has passed, you can repeat the same sequence of assignments. Let's say you have 14 docs and 14 shifts. The person on shift 1 on Monday does shift 2 on Tuesday, shift 3 on Wednesday, and so on. After two weeks, the person you put in on the first Monday is ready to do shift 1 on Monday again. The person on shift 1 on the first Tuesday follows the same sequence of assignments as the Monday person but shifted by one day. Instead of filling in the template weeks with all 14 people, you can put just one person's assignments in, store the template, and if you've enable the anonymous pattern feature, you can choose to restart the pattern after 1 day. When you put a person into any day on shift 1, the person will get the same sequence of assignments as the Monday person but starting on the selected day.